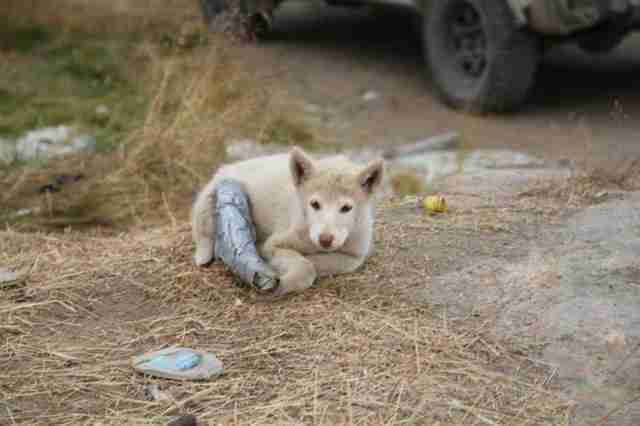 The vet spotted the puppy with the broken leg an hour before he had to leave the area. The puppy was limping, his back leg hanging at a funny angle. If the vet didn't help him, he knew the dog would probably die. In the United States, a dog with a broken leg isn't usually a life or death situation. 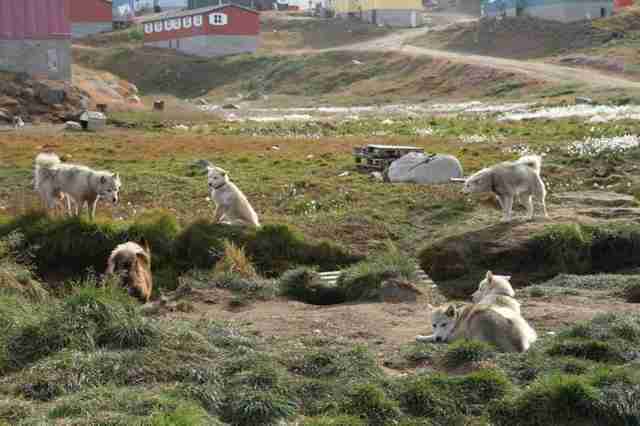 But in Greenland, where less than 60,000 people live, sick dogs are usually shot because of the lack of veterinary care. 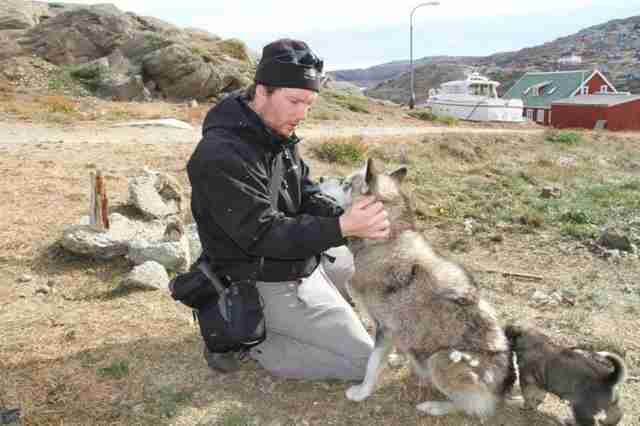 Dr. Jochem Lastdrager, a veterinarian who works with Travelling Animal Doctors and Darwin Animal Doctors, has been travelling to Greenland to try and improve conditions for the Greenlandic sled dogs, along with an Austrian animal welfare organization, Robin Hood. While Lastdrager can't provide vet care to these dogs year round, he's hoping that education programs - especially those focused on kids - will show people how to properly care for their animals. "We really believe that we can change areas by teaching kids," Lastdrager tells The Dodo, "and by creating more animal awareness." The Greenlandic sled dog is an indigenous, wolflike dog who's lived and worked with the Inuit people for centuries. 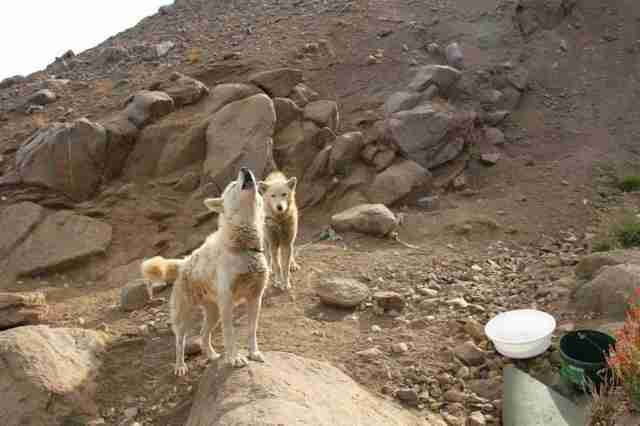 Today there are approximately 21,000 of these dogs living in Greenland above the Arctic Circle. The locals mainly use the dogs for transportation to hunt during the winter months, especially as there are no roads that connect the towns and cities. In the summertime, however, the dogs are rendered obsolete. Many are kept chained up on rocky, muddy patches of land a short distance away from the towns. 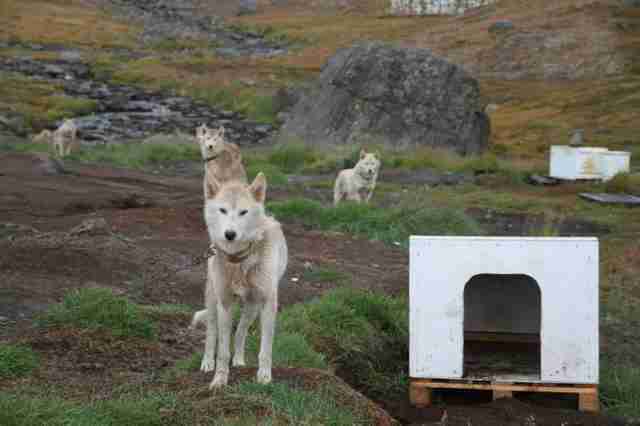 With climate change creating longer summers in Greenland, the dogs are chained up for longer periods each year - and often neglected throughout the season. While the government recommends that the dogs be fed every couple days, Lastdrager explains that some locals only feed their dogs once a week. 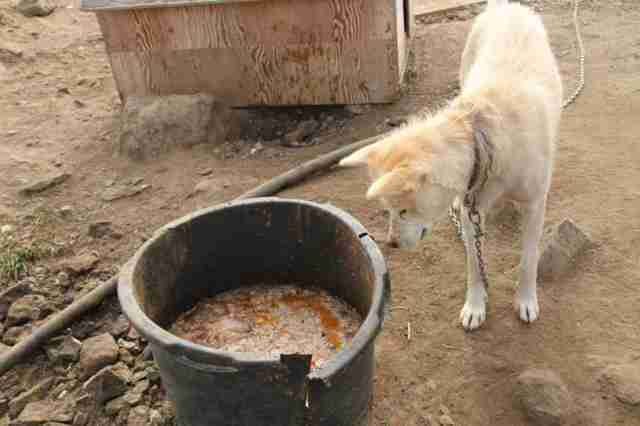 The distance from town also means that the dogs often don't get adequate water. "For these mushers to bring water for 10 to 20 dogs, while walking up to 40 minutes every day, is just impossible because they don't have cars," Lastdrager says. "They do have snowmobiles, but they're out of use in the summer, so they simply cannot provide basic care to their animals." 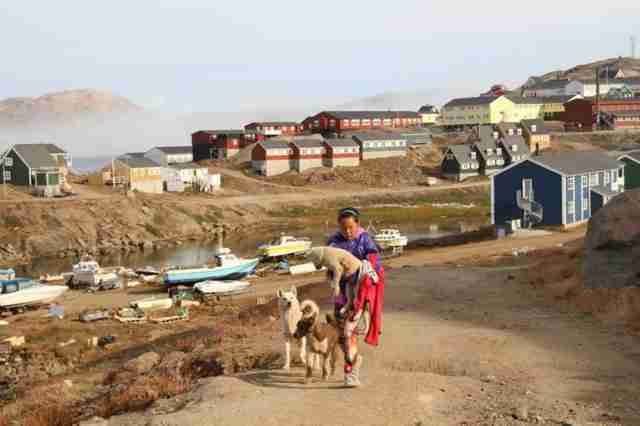 Greenland has also been hit hard by a financial crisis. Jobs are scarce, and most people rely on welfare payments from Denmark. "That money doesn't go to the dogs," Lastdrager says. "Some people don't feed their dogs 'dog food' or anything you need to buy. They feed their dogs whatever they hunt." Another issue is that the dogs' chains get tangled up, causing injury - or worse, death. "Those chains coil into each other, up to a point where it suffocates the animals," Lastdrager explains. "We had several cases like that where we were ten to fifteen minutes away from dogs being choked to death." In the case of the puppy with the broken leg, Lastdrager believes that his leg got caught in a chain, causing the bone to snap. But even with a broken leg, Lastdrager remembers how hard it was to catch the little dog: "He kept running away, and hiding in one of the doghouses." Prior to catching the puppy, Lastdrager spoke to a local girl who turned out to be the daughter of the dog's owner. "She really liked this particular puppy," he says, "so we talked to her about putting a splint on the dog." Lastdrager didn't have many medical supplies, but managed to correct the bone without causing the puppy too much pain, and forming a splint out of some plastic tubing found on a local construction site. Lastly, he wrapped the splint in duct tape to protect it from the rain. But Lastdrager worried about leaving; the splint would need to be periodically checked, and eventually taken off. "It was a hurry-hurry care," he says, "but this little girl was very, very motivated, which shows the interest kids have in the dogs. She even brought the dog home, which is quite unusual." While Lastdrager doesn't know what happened to the white puppy after he left Greenland that day, he hopes the dog made a full recovery under the girl's loving care. Lastdrager is returning to Greenland this week to provide veterinary assistance to the dogs during the country's largest sledding race. Then in July, he'll return with members of Darwin Animal Doctors to work on opening a summer sanctuary for the Greenlandic dogs. "We want to make a place where we can bring the dogs together and care for them during the summer," Lastdrager tells The Dodo. "By doing that, we're hoping to create this awareness that if you take better care of your dogs in the summer, you'll have better dogs in the winter. That's the way to get the local people involved." 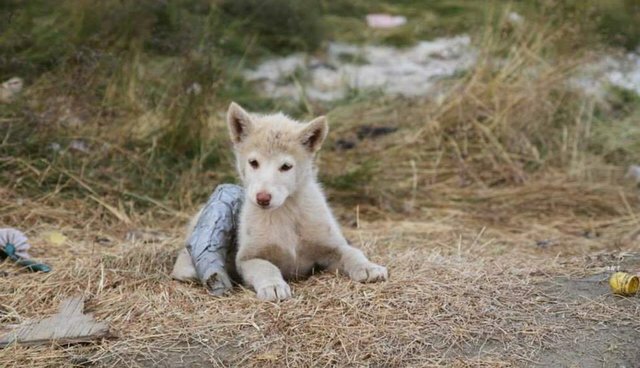 To support the work of Dr. Jochem Lastdrager and Darwin Animal Doctors in Greenland, please support their mission to save the Greenlandic sled dogs. You can also donate to Darwin Animal Doctors and Travelling Animal Doctors. One hundred percent of donations go directly to helping animals and providing education to local communities.